These bite sized potatoes make a great appetizer for a party or a side dish for a barbecue. They can be prepared the day ahead and baked for the second time immediately before serving. Preheat oven to 375 degrees F. Poke holes in each of the potatoes and spread them evenly on a baking sheet. Bake for 35-40 minutes, until tender. Remove from oven and allow to cool, about 1 hour. Slice potatoes in half. Using a 1/4 tsp measuring spoon, scoop out the potato centres, leaving some potato around the edge to maintain the structure. Put the scooped out portion into a mixing bowl. To the bowl, add the package of goat cheese, olive oil and black pepper and mash together with a fork until uniform. Add chopped chives and fold into mixture. 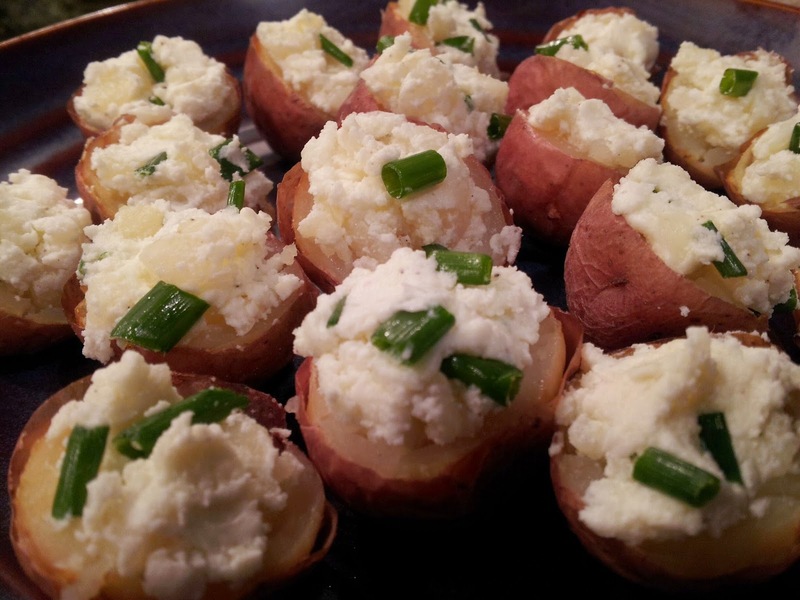 Using the 1/4 tsp measuring spoon, scoop the goat cheese mixture back into the potatoes and place on a baking sheet. Return the potatoes to the oven for 10 minutes, to reheat the potatoes and slightly brown them.